Officially dead, this oldtimer of miniature companies lives on as Ral Partha Europe and Ironwind Metals (in the US). 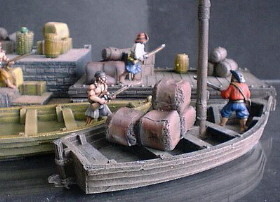 There can still be found a few pirates in the vast mass of fantasy miniatures produced by RP. They're in the "Heroes and Horrors" range, which has a pack of 'pirates and sailors'. This French company specialises in fantasy miniatures, made out of resin instead of metal. 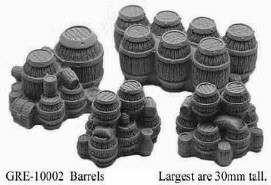 The figures come with integral square bases. Pirates are few, but they are there nonetheless. 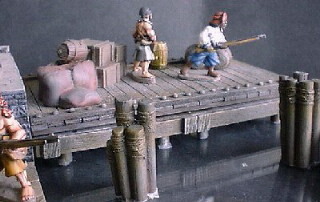 The adventurers section has "Surcouf le Pirate" with his accessories, while the dwarf section has three dwarf buccaneers. 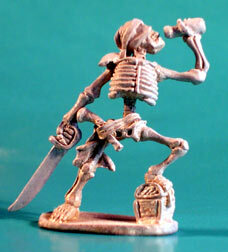 There's also a pack of very nice skeletal pirates. 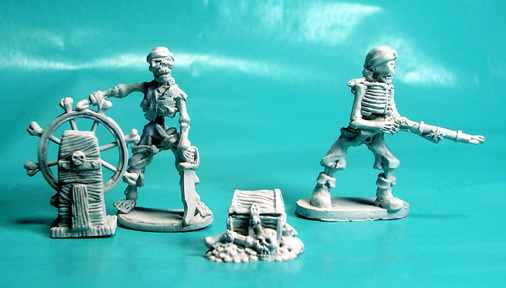 Moonlight Miniatures produces two ranges of Skeletal pirates. One in 34mm and one in 28mm. You can check out our review of the 34mm range here. Like their larger brethren, the 28s are sculpted in a slightly cartoony style that somehow oozes character in a way that makes some technically more realistic figures seem dull and bland in comparison. If skelly pirates are your thing, this is a range to look at. Now, one thing we didn't run into yet, is a range of ratmen pirates. But that would be crazy, no? Still, Fortress has just that with the "Pirats" in their "Funny Animals" line. 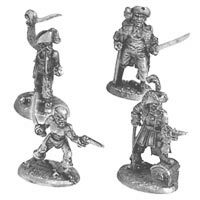 There's a slightly humouristic edge to this figures but they look nice, especially when it comes to the Pirat captains. These are cast in lead free pewter and come with resin bases. 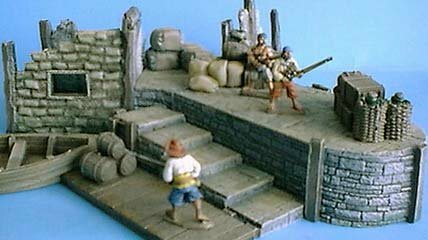 The range includes dueling pirats, pirats with melee & pistols and pirats with blackpowder guns. 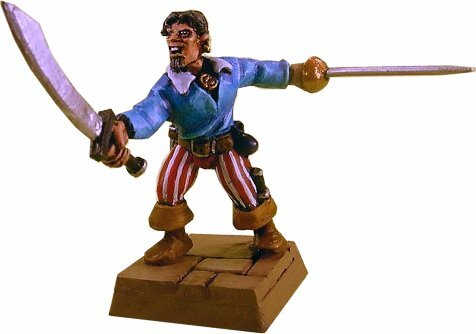 For all of you heretics out there, Andy has kindly produced a suitable pirate figure in the person of Diego Ramirez Lopez Lopez Villamaro Domingo Sanchez, Swashbuckling Rogue. This mini comes with optional pistol hand and loose pistol, just in case. 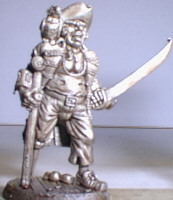 A small, but growing collection of pirate figures by sculptor René Durand (of Quebec). The figures are perhaps more aimed at the collector than the gamer, but should find a place in your collection easily enough. The Goblin pirate cap'tain (27mm sole to eye) is a must for any fantasy pirate range. Mostly known for their highly specialized line of 25mm Napoleonic-era naval figures, Abbots also carries a small line of 18th century pirates, with tricorne or stocking cap, including the all-important pirate with wooden leg and parrot. 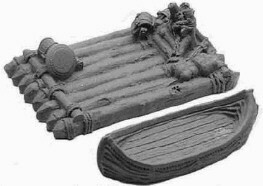 The Grendel range of miniatures and resin scenery has some interesting bits and pieces in the historical and fantasy ranges. 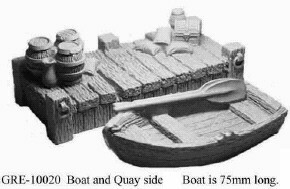 In the historical range these are the boat and quay-side, the barrels and crates or even the canoe and raft. 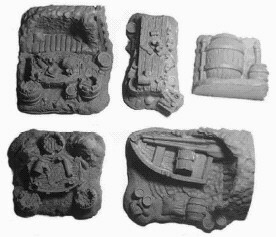 The fantasy range has a 'pub snug restaurant', suitable for some pirate recreation, treasure piles, a smuggler's inn and several tables and chairs to furnish your pirate (or other) tavern. There is a lot more great Grendel scenery to be seen in the Gothic & Fantasy Buildings Showcase. 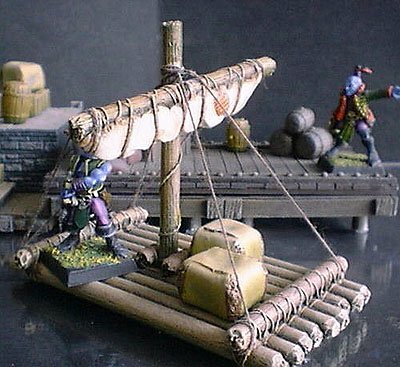 Ainsty offers some interesting boats and scenery items in the "Trader" line, be it rafts or sloops, wood mooring posts or stone jetties. And of course the trade goods themselves. All of these can easily be used to spice up your pirate games. You can see more scenery from Ainsty Castings in the Gothic and Fantasy Buildings Showcase. Aka that company which shall not be named. As a Showcase first I have decided to throw them a bone and include them in this showcase as they don't have any real Pirate range anyway and it might not be a bad idea to point out the useful models. Unfortunately we can't show you any pictures, not to infringe on their IP. 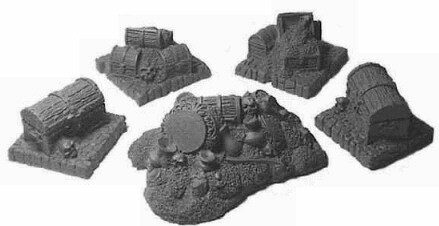 Suitable GW pirate figures are Long Drong's dwarven slayer pirates from the WFB "Dogs of War range" and to a lesser extent the (plastic) Empire militia set. From the Mordheim range we particularly direct attention to the Vampire Countess Marianna Chevaux, which would look great commanding a crew of undead pirates. Don't forget to visit Rob's Fishman Showcase for some deep sea monsters.